If you tuned in last week to The Longwood Look (Seven Threadly Sins) then you may have noticed that we delicately skirted the subject of UGG boots. These boots have issues; they're the focus of either desire or disgust, so we'll do our best to accommodate both opinions. 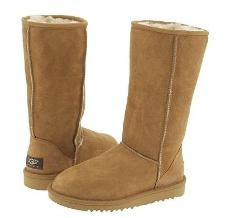 If you look up "UGG boots" on Urban Dictionary, you get this: "The name says it all. Some really UGGly boots that come in all different colors. Commonly worn with 4-inch skirts by girls with close to zero self-esteem." Jenni isn't that far from disagreeing. For her, UGG boots are mostly just overpriced for their looks, but since she's never going to own a pair, she won't know whether they are worth the investment. Additionally, the material used to construct UGG boots is obviously taken from a yeti, making them visually heavy, not slimming, and a violation of the Endangered Mythical Species Act. Megan bought her first pair of UGGs when she was in eighth or ninth grade; they weren't that cool and she had really never seen them before. A kid who learned to ski immediately after learning to walk, she looked at the brown boots in The Ski Barn and thought, "Those look cozy." And they are. But, being full of teenage angst, once the boots gained popularity and became a trend, Megan made amends for her purchase by noting unlike the thousands of UGGs she saw on a regular basis, hers had a zipper and were taller than the short styles that seemed to be coming out of the woodwork. Swearing never to wear them without first stepping into ski or snowboard bindings, she retired the boots to her ski bag and enjoyed them only after a long day on the slopes with hot chocolate by a fire every winter. Maybe it's nostalgia rearing its memorable head, but in the past year Megan has expanded her UGG collection to include a pair of moccasins and those more popular short boots that she hated so much at first. But why? The shoes are sort of irresistible once you put on your first pair; they're incredibly warm and, come on, they aren't that hideous. No, they aren't cute. But they're sort of like basset hounds-they're so ugly that after a while you realize that they're actually sort of cute. Like carbs and reality television, UGGs are best in moderation. We probably should have said this earlier, but we don't actually mean UGG brand-there's something called Emu brand, and we're sure you could find some boots with fur inside at Payless. It's like polo shirts have a collar, but they're not necessarily Ralph Lauren. We shouldn't have had to explain this, but you just never know. Anyway, as usual we've come up with some rules. If you're going to wear UGGs, keep these in mind. 1. We said this last week but we want to elaborate: boots with fur on the outside are just ridiculous. We're certain that this is where the whole UGG/UGGly expression originates, and for good reason. 2. If you are wearing a skirt or dress that's close to knee length and not tailored to be form-fitting, then you may cautiously experiment with the boot/dress look. Megan has a couple dresses that are right around knee-length and she wears both her longer UGGs and a pair of tall, leather boots with them. Boots can take dresses and skirts that you used to only be able to wear in the spring and summer and transform them into fall and winter outfits. 3. A popular term for young women who wear boots with something too short and/or tight is "Eskaho", meaning they look like Inuit prostitutes. Get it? Good. If you're wearing a miniskirt, don't wear boots. That's just silly. And if you have a short, tight sweater dress on, boots actually look quite nice. But for goodness sake, wear some tights. It's not just good fashion sense; it's good taste. 4. We also enjoy cute rain boots, and frankly, Farmville's against permeable footwear in any case. Try tucking your jeans into a pair of cute patterned or brightly colored rain boots when the weather is more frightful than your three-hour lecture class. 5. Want to be warm and taller? A pair of booties - short, high-heeled boots - make for warmth and whimsy. They look especially nice paired with dresses and tights or leggings.